In The Solitary Reaper, Wordsworth created an evocative celebration of singing at work. He was not alone among Britain’s great poets and writers in referencing people singing at their work. William Shakespeare, Robert Burns, Thomas Hardy, George Eliot, and D. H. Lawrence all used description of people singing while working within their writing. Although fictionalised, such representations indicate shared understandings, across many centuries, of labour accompanied by song. 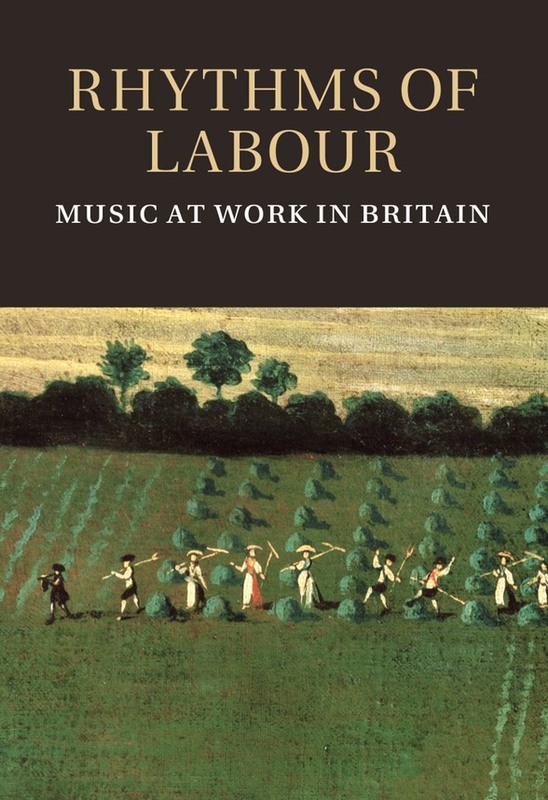 In our linked book, Rhythms of Labour: Music at Work in Britain (Cambridge University Press, 2013), we show that singing at work was, indeed, common across the majority of the most populous pre-industrial occupations. The spinners sang, the weavers sang, the knitters sang, the sailors sang, the ploughmen sang, the cobblers sang, the tailors sang, the waggoners sang, some fishermen and fish-gutters sang, the harvesters sang, the women at the waulking sang, the dairymaids sang, the washerwomen sang, the hop-pickers sang, the stone-breakers sang and even some mine-workers sang. We cannot claim that we would have heard them all the time over centuries, and in every place, but there is enough evidence to indicate the existence of enduring cultures of singing at work. Twenty men and boys scythed the corn and sang as they went. We have been just as promiscuous as singing at work cultures in our choice of song types for this album. Here, you will hear work songs, beside musical hall songs, beside minstrel songs, beside popular traditional songs, beside sing-along pub songs. And what we hope for is that, with some help from the context provided in the liner notes, these songs can begin to be heard as sung at work. Gladly, some recordings actually do feature the noises of the work process, but when they do not, this CD asks us to re-imagine the singing of these songs within the work setting, and to consider all the various forms of meanings that workers might attach to them in their specific workplaces. In the Rhythms of Labour book, we examine the meanings that singing at work had for people under three main headings. First, singing at work offered both fancy and function – the singing of songs allowed people’s imaginations to flower, just as they helped the flow of the work to be accomplished. Second, singing at work helped express and create a sense of community among people at work. There can be no clearer or more elemental statement of this than the tailors’ song included here, We Be.All Jolly Fellows who Follow the Plough Finally, singing at work also offered workers the opportunity of raising their voice, in the metaphorical sense of airing interests and grievances. Our notes below ask us to re-consider one of the most commonly collected traditional songs in England, , in light of the way it helped workers express their voice. To honour the process of singing within the work context, we have ordered the recordings on this CD by occupation. Most of the singing on this CD comes from workers whose jobs had not yet been industrialised. In the main, industrialisation brought musical silence to workplaces – either because of employers explicitly banning singing at work, or because of the roar of industrial machinery. But some pockets of singing at work did continue in some factories. The last singing on this compilation features songs known to have been sung in factories. The tone is noticeably darker, as workers, in part, express their experience of alienation within the workplace. Mary Brooksbank’s The Jute Mill Song, and Tom Daniel’s Poverty Knock are good examples of this. We feature songs from England, from Wales, from Scotland and from Northern Ireland, in our attempt to celebrate this singing at work across the British Isles. We have used three main sources of song material. We use songs sung by workers that were recorded by collectors from the 1920s and 1930s on. These were found in archives such as The School of Scottish Studies Archive at the University of Edinburgh, and the National Sound Archive in the British Library. Because industrialisation came early to Britain, and industrialised many occupations before the invention of audio recording technology, we could not just rely on these audio-recordings. We also had to turn to songs (referenced as sung at work) that were collected by hand by earlier waves of song collectors. In these cases, Bob Thomas and Gordon Jones (from the Harbourtown label) and Sam Lee helped us by asking some contemporary singers of traditional song to offer new versions of the songs. We are delighted that Laura Huckenhull, Brona McVittie, John Birdikin, Lee Enstone, and Will, Ed and Ginger were happy to take part in this. 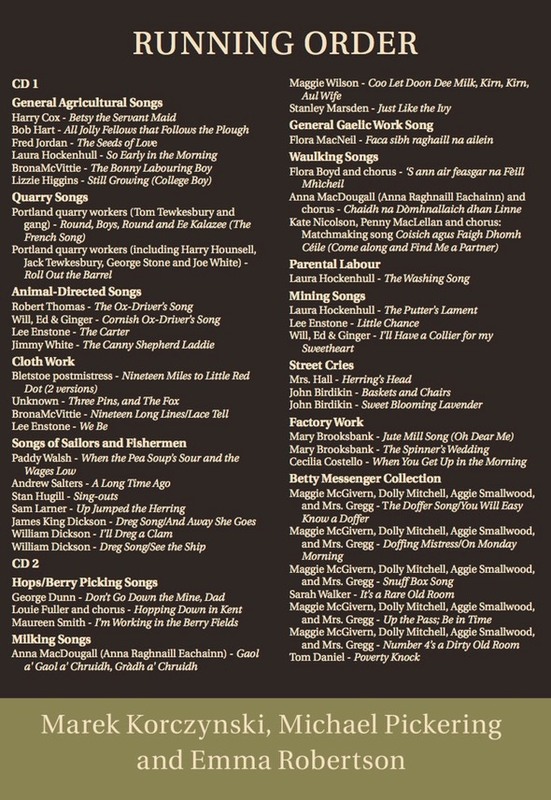 Finally, we also draw on some songs known to have been sung at work that have been available on a range of labels which specialise in traditional song. 12. Jimmy White - The Canny Shepherd Laddie (P)2007 Topic Records Ltd.
17.Paddy Walsh - When the Pea Soup’s Sour and the Wages Low (P2007 Topic Records Ltd.
7. Flora MacNeil - Faca sibh raghaill na ailein? (P)2007 Topic Records Ltd.